When you get the chance, do check out the full write up on Micheal’s Strategic Aesthetics Blog. DT, Thanks for your support. While it is true that usually a Design Director is The Evangelist, etc., I wanted to leave it open to interpretation. For instance, my company’s VP of Design balances the Conductor *and Evangelist roles well. He knows when to give input on details, and when to challenge the context of a product. (I believe this is similar to your concept of “zooming.”) I didn’t want people to feel confined by these roles. For instance, young designers can exhibit leadership skills that make them good Evangelists, even though they may a long ways off from having CDO on their business card. Kidding aside, this is indeed the reality of any design team and a very flat design management structure. It is very common for design managers to also have a creative direction role, whereby the opposite is also true. Thus the other important thing to point out in your chart is that its on an axis with various degree of weight on either side. In many way, having it aligned to actual roles will help budding designers understand the skills and behavior required to get there. hi DT. Thanks for this post! As usual, very good information. 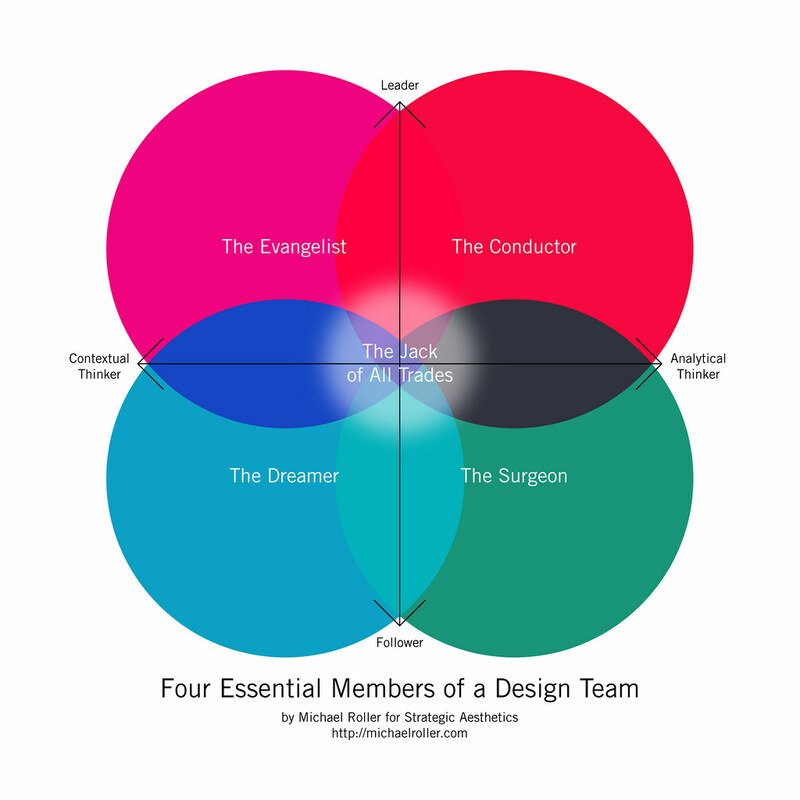 Well, just wondering, is it possible for an individual to become the Evangelist (Creative director) or the Conductor without having had experience in getting their hands dirty being Concept Designers (Dreamers) or Realisation Designers (Surgeons)? Do correct me if I’m wrong but there seems to always be a hierarchy of sorts within the design industry i.e. junior designers needs to work their way to the top. I was wondering if the hierarchy can be broken for an individual to get to a design management role should he/she had not gone through the ‘traditional’ route.